Two local groups are urging Saskatoon residents to speak out and help protect the Northeast Swale, native prairie rich in wildlife and plants. A plan that will determine land use around Saskatoon for the next 60 years is going forward for approval this month. Candace Savage (Wild About Saskatoon, Northeast Swale Watchers) is urging everyone to complete the online survey set up by the Saskatoon North Partnership for Growth. Stay Wild YXE has prepared an infographic encouraging you to complete the survey by March 15. The City of Saskatoon can play an important role in protecting the Northeast Swale. 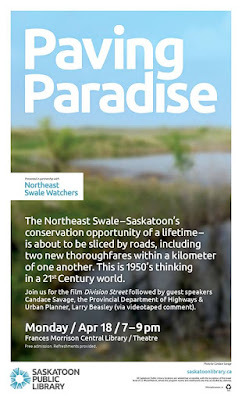 Saskatoon’s Northeast Swale Watchers are recommending that the City take the following steps to protect the Swale. They recommend you share this information with your City Councillor. "An integrated City-administered Swale Buffer Plan, parallel to the MVA NE Swale Master Plan, should be implemented since the surrounding City development creates disruptions and pollutants that will potentially affect and degrade the Swale. This Plan should include, as a minimum, all points below. 1. Include Petursson's Ravine and Central Avenue Crossing within the Swale as indicated in the MVA Northeast Swale Master Plan. 2. Insist that the Province relocate the Perimeter highway to Clark's Crossing to go around the Swale within the Greater Saskatoon area region. 3. Impose Dark-sky policy lighting standards in neighbourhoods adjacent to Swale though zoning bylaw changes that include neighbourhood roadways, residential and commercial properties, lit signage, and minimally-lit roadways through the Swale. 4. Eliminate bottlenecks for safe wildlife passage, modelling from Edmonton's Wildlife Passage Guidelines, and ensure that there is an ecological network in place to enable the wildlife to move unimpeded from the river through the Swale and back. 5. Ensure that wildlife crossings over roads and small animal crossings under roads are designed and installed for all roadways. The success of these crossings should be monitored. 6. Ensure that traffic-calming measures, including an enforced 50 kph speed limit, are implemented on all roads through the Swale. 7. Ensure that there is minimum damage to the Northeast Swale and Small Swale during road and neighbourhood construction. Follow the City’s Predevelopment Protocol and the MVA’s Construction Protocols (articulated under the revised Development Review process) in a proactive way that includes environmental monitors with stop work authority. 8. Ensure that the MVA has sufficient funding to finance the MVA Northeast Swale Master Plan and expand the Master Plan to include the Small Swale. 9. Enact long-term legal protection of the Northeast Swale and the Small Swale though a change to the Zoning bylaw though a special designation mandated by City Council. 10. Ensure that the UH3 area is either not developed, or that the current design is scrapped and redeveloped as a model sustainable community as suggested in Moriyama's 100-Year Plan. The current plan does not support designated environmental reserve lands that should be in excess of the minimal 10 per cent for parks, playing field etc. and does not allow for an efficient public transportation plan. 11. 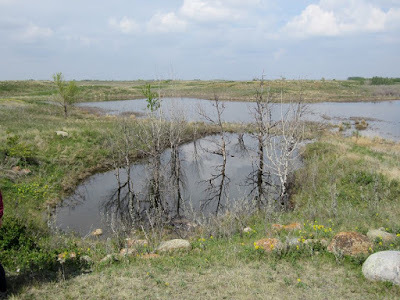 Ensure that the storm water handling systems do not allow contaminants to enter the adjacent wetlands. They are experimental so careful monitoring will be needed, especially since regulations for the Pesticide Use policy and the Wetlands policy are not in place. 12. Ensure that environmental protection policies are coordinated and adopted with the P4G group through the Saskatoon North Regional Study for the entire Swale region." To find out more or to get involved, be sure to attend a screening of Paving Paradise and the follow-up discussion on April 18. The Swale is about to be “sliced and diced” with roads – is that really what is best for Saskatoon’s future?